Boasting a cam-type clamp which allows single action clamping of tubes, the Park Tool PCS-10 Home Mechanic Repair Stand will work well with recumbents and bikes with unusually shaped tubing. Featuring a three-point leg system with a reinforced centre yoke for support and stability, it also has a composite top tube for 360 degree rotation. Designed to quickly and easily adjust in height, the stand will fold down to 41" for convenient storage and transportation. - L.M. Easy to erect and excellent quality, very sturdy whilst washing my bike. Packaging, although it arrived in a very sturdy box, the box was undone down the length, staples all open, fortunately nothing was missing or damaged. A ripper. My bike has never looked cleaner. The stand is quite big so need to consider that before purchase, doesn't fold etc. But solid as a rock and worth the few hundred big ones to clean your pride and joy ! Highly recommend. Make sure you purchase the handle bar holder too. If you're like me, bike maintenance is a bit of a chore - I'd rather be riding than cleaning it. However, this stand made a huge difference - it made things more straightforward. I don't have to lean over or kneel/sit on the ground - I can do things at a better height. Lay out some cardboard underneath it and it will catch all the stuff that falls off the bike when you clean it. You can inspect the wheels, spin them freely, adjust FD and RD if need be. Cleaning still isn't a joy, but it sure isn't as much of a pain as it would be without this. Buy once, you'll forget the cost years down the track. Very happy so far with the stand. It holds my bike firmly and I can work on then confident that they won't do anything silly. Easy to attach bike. Really good piece of kit and will make working on your bike so much easier and safer. As Park Tool products go this isnt that expensive compared to their Team issue kit,only real difference is the more expensive ones are lighter and fold to a smaller size but for the average weekend mechanic this is all you need. A very well made bit of kit. Easy to secure the bike & adjust to any position. I read reviews & decided to spend a little more than the PCS-9 which I think was the right choice. Great price from Probikekit & it arrived very quickly! This stand does the job very well. It is big, stable, and sturdy. It looks to be made of quality parts. It folds up pretty quickly and easily. Once folded, you could stand it up in a cupboard, or corner of the room etc. and it doesn't take up that much space. Recommended. 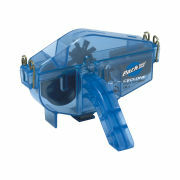 I cannot fault the Parktool PCS10 it is solid, well built and very easy to put together. It makes working on the bike so much easier and folds away neatly for storage. Excellent value for money. Would have been nice to know the item was out of stock at time of ordering but other than that excellent service from probikekit, best price on the web and delivered well before the date it was expected in. I would use probikekit again and recommend them. Just bought the PCS-10 stand. works great. Aok on delivery.